Your web browser is probably one of the most important applications on your computer so you want to be extra careful about creating backups of your user profile, bookmarks, browsing history, and other browser personalizations in case of a computer crash. It's also useful when you want to migrate to a new computer and don't want to start over with a fresh browser profile. 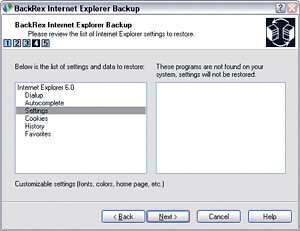 For Internet Explorer users, the eponymously-named Internet Explorer Backup can help you backup and restore your favorites, dialup accounts, cookies, passwords, and other browser settings. You can also schedule automated backups on a daily, monthly, or weekly basis. On the other hand, if you're using Mozilla Firefox, MozBackup can create backup files of your Firefox profile, bookmarks, extensions, cache, and other settings. 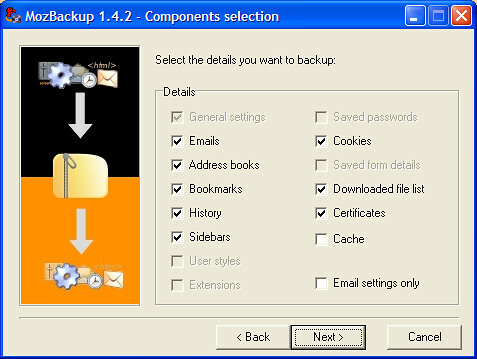 You can also use it to backup your emails and contacts if you use Thunderbird.